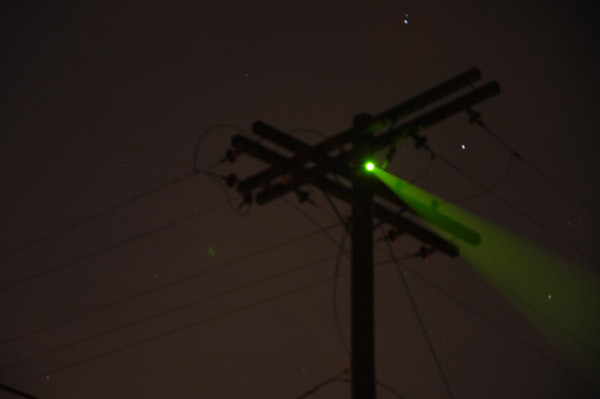 A few weeks ago, I got an email from Noah of Bigha asking if I wanted to try one of the Jasper green lasers that he's selling. After verifying this wasn't some strange spam, I said yes. Several days later the laser arrived in a tube and I started to play with it a bit. Thanks go to James for helping me take several pictures of the laser beam and also to Jason for taking a picture at the gun range. The little oval black button is the trigger that turns the laser on. 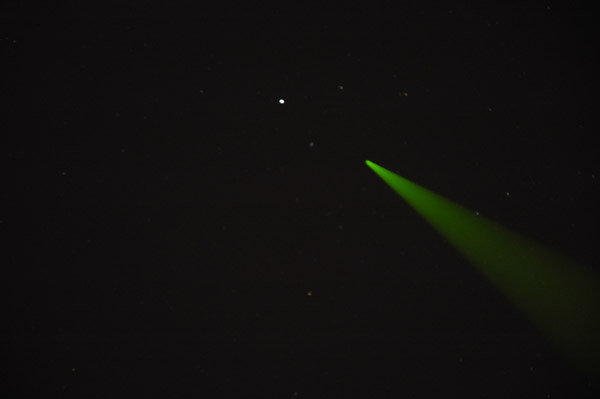 Unlike the red lasers, you can keep the green laser on indefinitely. 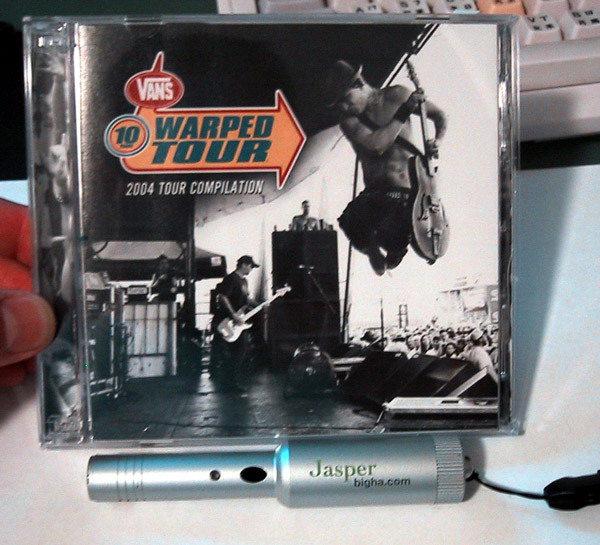 Here is the laser with the Universal Size Reference Unit, a CD case. The laser comes with a lanyard so you can hang it around your neck and not lose it. 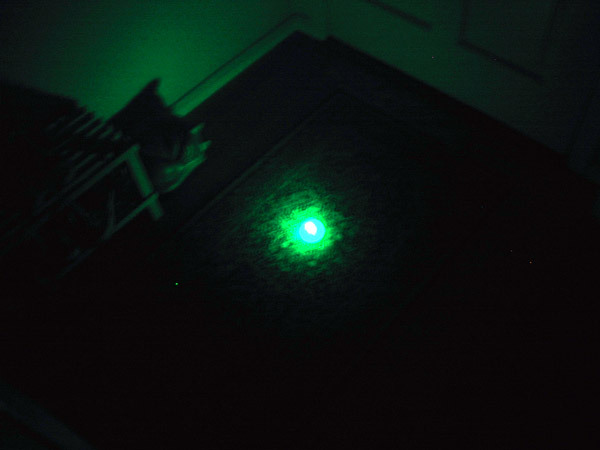 The green laser is incredibly bright. You are sitting there thinking, "Yeah, yeah, bright smight, I've seen those little lasers before. How bright can it be?" Well, Mr. Smarty Pants, it's so bright you can see the beam itself at night as it illuminates the air in the path of the beam. 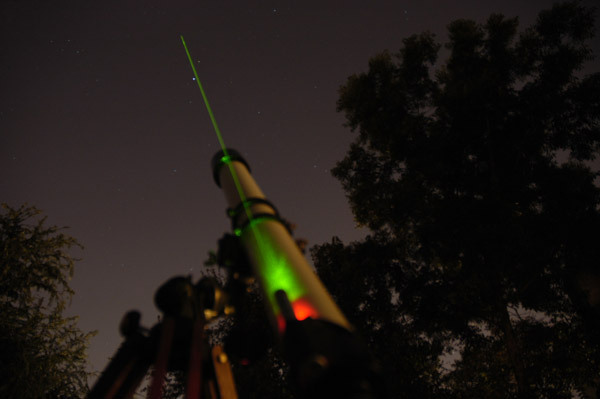 This is a photo of the beam pointing up at night being used to point out stars. For the rest of the review, click More. 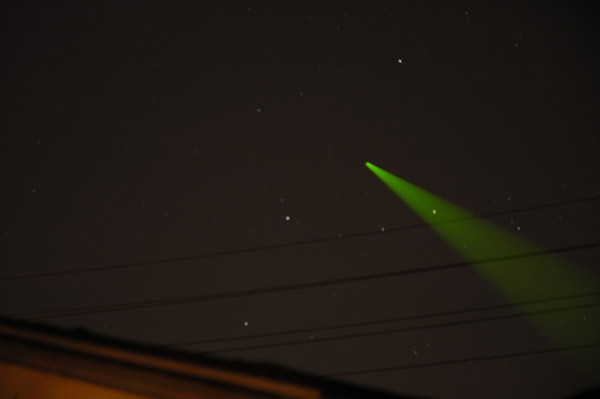 This is the laser pointing out the stars with the roof in the background for perspective. Pretty nifty eh? The strength of the beam is high enough to carry the light quite a distance. Pointing out a nearby telephone pole. This is how it really looks, not a camera trick. Much further away is a palm tree that I could easily hit. 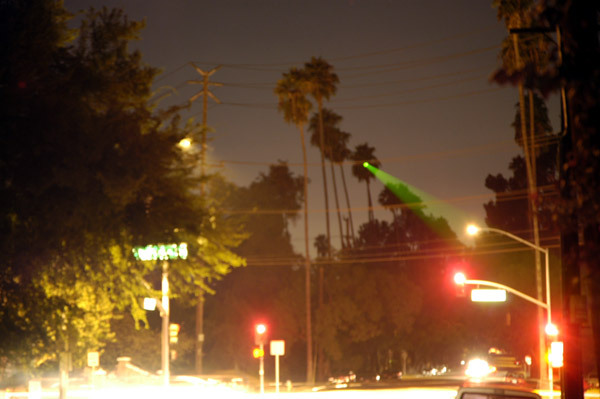 The laser could hit the tops of palm tress that were a half mile away. Yes, I measured how far the palm tree was away. Is the strength of the laser sinking in yet? 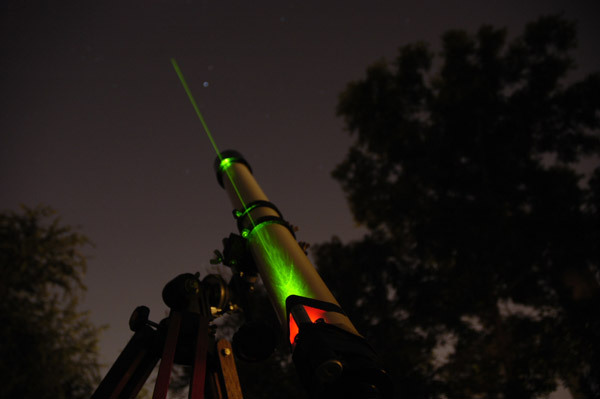 We took the laser into the backyard and strapped it to my telescope as a sighting scope. James's photo looks damn cool doesn't it? Gaffer's tape is what was used to attach the laser, so it wasn't precisely aligned. 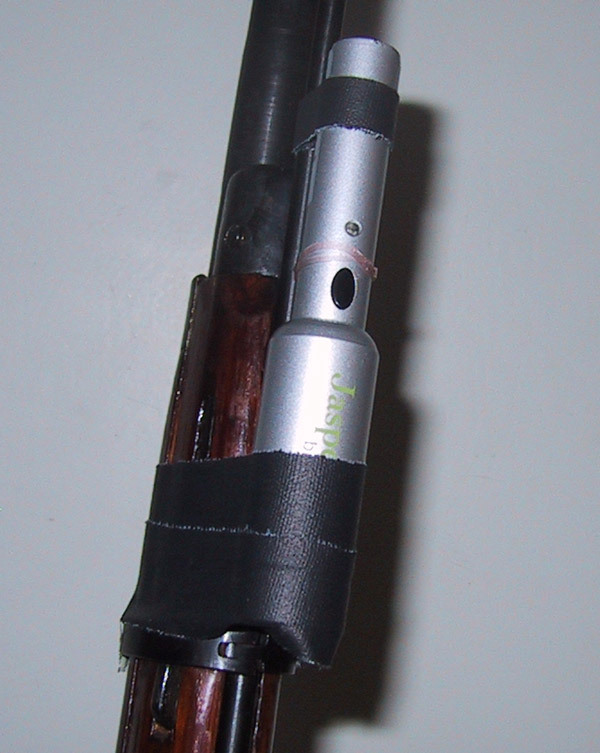 If I was serious, I would have used a real sighting scope mount and centered in the laser for accuracy. Too bad the moon wasn't high enough in the sky to point at with the laser. My boss is a laser expert back from the days when they were inventing laserdisc inscribing. I asked him what would be good for diffusing the laser light. He said the optimal object was a bouncy superball. This is an image of hitting my daughter's transparent superball with the laser. I wasn't content to simply point the laser up in the air every night, so I thought up another use. 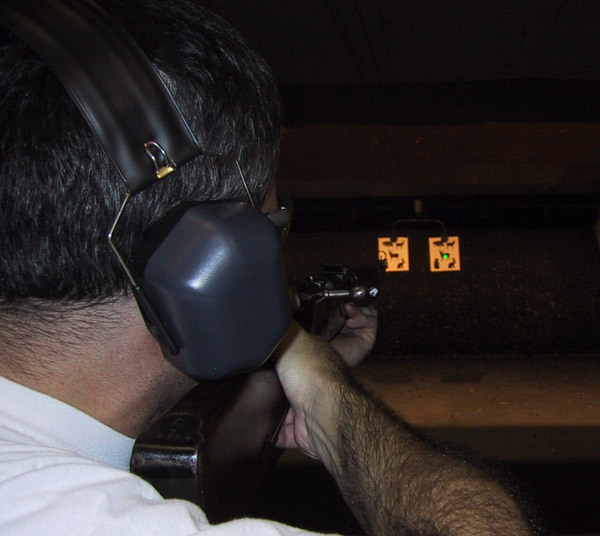 Rifle targeting! I strapped the Jasper to the end of my rifle. The laser doesn't have a constant on mode, so I used a girls pink rubber hair band as an impromptu perma-trigger. Here's an un-closeup of the setup. Note that I used the all purpose gaffer's tape again. 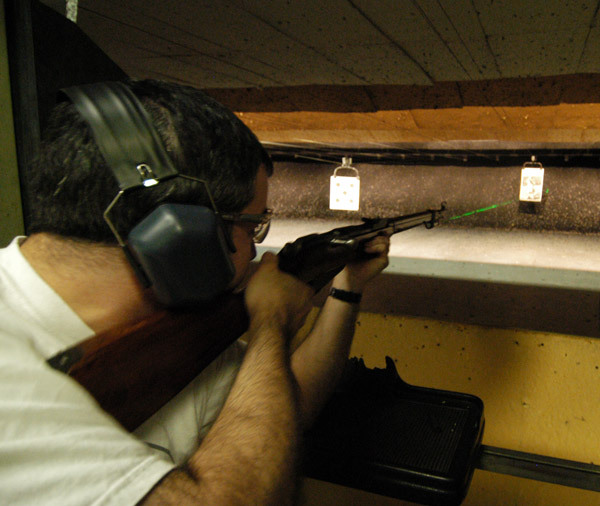 At the gun range, the laser was a little off. Again, I needed to mount it seriously instead of using tape. After every shot I had to try to manually readjust it. 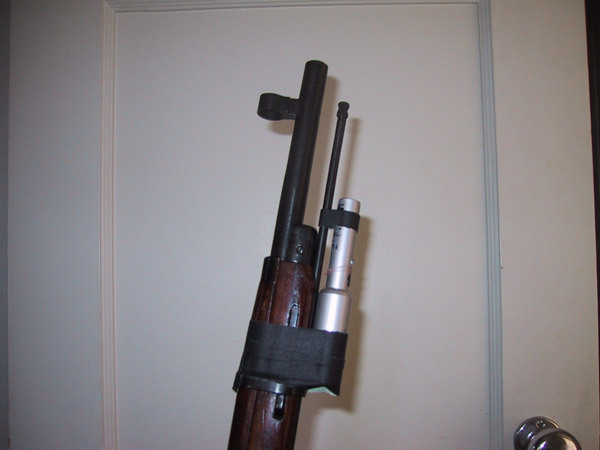 Although, for a shotgun, it would allow fairly accurate hip shooting. Here's what it looks like in person. You can see the beam and the path of the bullet easily. Jason got a nice shot here. There's probably a ton of other things you can do with the Jasper like strapping it to a cantenna while wardriving or scaring neighbors at night out for a walk. I'm glad I had a chance to play around with the Jasper for a while. My daughter love it and had a great time playing with it. They couldn't get enough of bouncing the light off of mirrors and using it outside during nighttime strolls. Pretty much everyone that saw the Jasper in action thought it was pretty damn cool. It's a bit expensive, over $100, but the geek coolness factor is quite high. It is a product that lives up to it's hype.